Xcel Energy’s SmartGridCity™ Consortium provides the city of Boulder, Colorado a portfolio of smart grid technologies designed to provide environmental, financial and operational benefits. What can we learn from this project that started with exuberant hype and ended with acrimonious finger pointing? All told, SmartGridCity included automating three substations, laying 200 miles of fiber-optic cable and installing 4,600 residential and small business transformers and 16,000 smart meters. SmartGridCity™ integrated intelligent sensors, distributed communications and analytical control applications from the substation to the customer premise, enabling a host of high value applications. These applications are expected to provide significant utility and customer benefits including improved service reliability, reduced operations and maintenance costs, optimized system losses, reduced capital costs, better managed renewable energy resources, and reduced customer energy demand. Boulder, Colorado was the guinea pig because it is the right size (population of approximately 100,000 people), the home to the University of Colorado and also the National Institute of Standards and Technology, which is already involved in the project, and several other federal agencies. Plans are to spend $100 million to build a "smart-grid city" that will become a test bed for emerging power technologies. As of mid July, 15,000 smart meters have been installed in Boulder with another 10,000 planned. A web portal that shows consumers with smart meters their usage in 15 minute increments should be rolled out soon. A key element of the pilot is to understand if and how consumers with smart meters change usage relative to those without such information, as the success of the smart grid is “totally about behavior change. Members of the SmartGridCity Consortium include Xcel Energy, Accenture, Current Group, Schweitzer Engineering Laboratories, Ventyx, GridPoint, and OSI Soft. There are several other public and private collaborators including SmartSynch and Landis+Gyr. Analysis Portal - Gives secure access to usage information, billing history and means for interactively helping customers discover how to best use energy taking into consideration both price and environmental impacts. Control Portal - Gives customers the opportunity to set energy use preferences for major appliances and a limited number of household outlets. Information Portal - Educates customers about how their energy is produced, and offer tips for reducing costs and lowering their carbon footprint. Smart Substations - Infrastructure upgrades will create more sophisticated intelligence in the substation, which will allow the utility to better monitor and adapt to customer needs, while making real-time decisions based on current grid conditions. Smart Feeders - The feeder distribution system will consist of communication-enabled smart reclosers and switches as well as smart feeder assets to provide power system information and perform automated functions. These assets will allow Xcel Energy to monitor power flow, outages, and overall asset device health. Smart Distribution System - Power analyzers will be installed at each distribution transformer and incorporated into smart meters to provide real-time data on power consumption, outages, restorations, and fault locations. Included full-system automation, monitoring and smart meters for the first group of SmartGridCity customers. Involves upgrades to two substations, five feeders and nearly 15,000 meters (representing both residential, commercial and light industrial customers) in Boulder. Web portal provided consumers with insight into their energy use and information for better home energy management. Some customers could choose to have in-home automation tools, allowing increased control over home energy use and costs. Phase II: September 2008 - December 2009 - Xcel Energy, along with its partners, will have a field crew of up to 115 people dedicated to the deployment and build out of SmartGridCity. By the end of Phase II deployment, Xcel Energy expects the approximate size of the SmartGridCity™ customer base to grow to 50,000 residential, business and light industrial customers. Eligible customers can opt to participate at any level they choose. Complete the installation of a distribution and communication network for remaining areas within Boulder (an additional two substations, 20 feeders and smart meters for an additional 35,000 premises). The city would be outfitted with infrastructure to support renewable energy sources such as wind and solar. Expanded in-home automation installations. 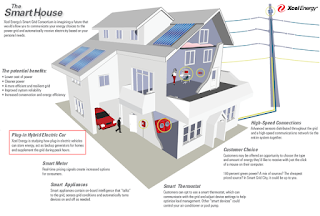 Xcel plans to install in-home control devices in the smart-grid city to automate home energy use in 1,200 homes. As of November 2010, it was on standby until security issues can be worked out. But, as Greentechgrid put it, at the cost of $2,173 per location, it’s hard to imagine that any results from the pilot will sway public opinion, unless home automation includes a free 3D television. Begin initial integration of plug-in hybrid electric vehicles, solar and wind co-generation sources onto the grid in Boulder. The city will feature plug-in hybrid-electric vehicles that charge and discharge to the grid. In fall 2009, Xcel Energy filed for an electricity pilot pricing program with the Colorado Public Utilities Commission (CPUC) to coincide with implementation of SmartGridCity™ in Boulder, Colo. The pilot will include no more than 2,000 customers and is designed to provide customers with better price signals so they can make informed decisions about their energy use. The program is expected to produce reductions in consumption during on-peak periods or to shift some consumption to off-peak periods. Residential customers in Boulder who have a smart meter can choose to participate in the pilot, which will run until Dec. 31, 2011. In February 2011, a flier sent to thousands of randomly selected Boulder residents by Xcel Energy appears to force the recipients to sign up for a pilot pricing program, causing outrage among some customers. The SmartGridCity pilot pricing program charges participants, who must have smart meters, more than they are paying now during periods of peak electricity demand -- from 2 to 8 p.m. -- and slightly less than they are paying now during the rest of the day. Phase one of the pilot plan began in Fall 2010 with 1,249 volunteers. But phase two of the plan, scheduled to begin in 2011 seeks 5,000 randomly selected volunteers. In February thousands of Xcel customers in Boulder began receiving letters from the utility that say, in bold, "You have been selected as one of the participants for this mandatory program. Your response is required to select your top two choices by March 1st." The outside of the flier says, "Your response is required" inside a red box. In fact, customers who do not respond to the mailing at all will continue to be charged the standard rate, according to paperwork filed by Xcel at the Public Utilities Commission in December. And customers who do respond can choose from four pricing options, one of which would make no change to the way they are now charged for electricity. But the fact that this information cannot be found anywhere on the flier -- which also invites customers to attend one of five informational meetings next week -- angered some recipients. Some Boulder residents, including City Councilman Matt Appelbaum, say the design of the pricing pilot is flawed and that Xcel hasn't given customers the tools they need to actually track their own energy use and, therefore, figure out how to shift use away from peak hours. Appelbaum said two of the most important tools that are now lacking are the ability for a customer to see his or her energy use in real time and the ability for a customer to program use -- potentially turning on some appliances in the middle of the night instead of during peak hours. Now, a customer with a smart meter can only view yesterday's energy use at 15-minute intervals. Xcel said in a filing with the CPUC that they expect residents who sign up for the time-of-use pricing categories in the pilot to save customers between $37 and $47 per year. But that might not be enough of an incentive. Regulatory Rate Case - In December 2009 the Colorado PUC approved an $11 million rate hike to cover additional costs (among other things) but told Xcel it now needed to go through the process of filing a ordered the utility to file a “Certificate of Public Convenience and Necessity” and it needed to prove why it needed to increase rates. The rate increase and the details of the request for CPCN, are what has been leaking out all these ugly details and media coverage of the mismanagement in this smart grid saga. The decision was favorable to the utility, as it approves a figure that is three times higher than Xcel’s original estimates on cost recovery, and which has already been opposed by Colorado’s Office of Consumer Counsel and two of the state's largest industrial electricity consumers. The CPUC rendered its verbal decision on cost recovery on Jan 5, 2011 and its written decision on Feb 8, 2011 overruling the Administrative Law Judge and whacked 38% from the $13 million a year the utility charges customers to pay for the SmartGridCity pilot project. That means Xcel can include about two-thirds of the $44.5 million total cost of the project in its rate base, according to a Denver Post news article. Xcel won't be able to get its hands on the rest, about $16.6 million, until it can demonstrate the project's benefits to consumers. When an Xcel executive told the CPUC in these hearings that the utility would never have begun the project if a cost cap was imposed, Commissioner Tarpey retorted that the message he was hearing from Xcel was "yeah, we really want to do it, but not with our money." The CPUC had allowed Xcel to retroactively file a certificate of public need and convenience, or CPCN, for its high-end estimate of costs, so the utility has been recovering costs from ratepayers since January 2010. In 2011, that charge on ratepayers' bills was reduced to reflect cost recovery of $27.9 million—the amount that Colorado's Office of Consumer Counsel (OCC) had pegged as reasonable. On Feb 28, 2011, Xcel filed a 19-page application for an RRR (rehearing, reargument and reconsideration of the CPUC's decision) Xcel's logic was that the CPUC looked back over the project's evolution to justify withholding part of the requested cost recovery, while not looking forward to pending results on the project's various value propositions—including how SmartGridCity innovations might be applied elsewhere in Xcel's multi-state service territory. A month later, the CPUC simply said "no" to the RRR request. "Public Service (aka Xcel) has the opportunity to be granted recovery of the remaining investment costs in a future adjudicated proceeding, if indeed Public Service shows it is warranted," the commissioners wrote. On Jun 27, 2011, the CPUC again rejected Xcel's latest effort to claw back more cost recovery on its SmartGridCity project. The CPUC also decided that Colorado's regulated utilities should file periodic plans relating to smart grid generally and, specifically, that applications should be filed for smart meter proposals. And the CPUC wants details: the number of meters, quantified impacts on resulting energy usage, peak load, demand side management participation, cost/benefit analyses, a detailed consumer outreach/education plan with a completed customer segmentation study and an impact assessment on low-income or other vulnerable groups. Further, the CPUC found that one of smart meters' primary benefits is as a platform for dynamic pricing and that "system-wide smart meter implementation concurrently with system-wide changes in rate design is likely to elicit negative customer reactions" regardless of customer outreach and education. That conclusion was informed by the CPUC's discovery that "the residential customer class is far from homogeneous in terms of usage, attitudes, values and interest level" in their energy service needs. The commission goes on to suggest that any smart meter rollouts in Colorado be opt-in and target the most receptive residential customers first, which limits its system benefits but aids long-term acceptance; and that customer segmentation (using third-party help if necessary) should be applied to achieve this; that a default rate be offered in the near-term. The idea is that Dynamic pricing can't be forced on customers, and spending a lot of money on interval meters makes no sense without some form of time-based pricing. Now at least Colorado has a framework for evaluating smart grid projects and the regulated utilities under its oversight know their obligations. Xcel has said that its actual data collection, commenced in Fall 2010 will be complete in 2011 and we await its report on the project's value propositions. Certainly Xcel will seek to demonstrate statewide ratepayer value, as $16.6 million rides on it. On May 21, 2013 the Colorado Public Utilities Commission ruled that Xcel Energy will not be able to collect the $16.6 million balance it says it is owed for work performed on the SmartGridCity project in Boulder. The ruling is in line with an earlier decision by an administrative law judge that the utility should not be allowed to collect the remaining $16.6 million in costs it incurred in the project because it had not met established criteria demonstrating customer benefits, according to a story in the Boulder County Business Report. The PUC in early 2011 allowed Xcel to recover $27.9 million in program costs from customer rates, but withheld the remaining $16.6 million until the utility could demonstrate benefits to customers, and provide a comprehensive plan. The SmartGridCity project began in 2008 with a lot of optimism, but along the way Xcel had to deal with unanticipated difficulties and issues that bumped the total project cost to $44.5 million, well above the initial numbers. There has been enough dissatisfaction among Boulder residents and officials with the project that the city council is expected to vote in April 2013 on splitting from Xcel and developing its own municipal utility. Peak Demand Reductions - Significant decreases in residential peak demand energy consumption achieved by providing real-time price and environmental signals in conjunction with advanced in-home technologies. Empowering customers with tools and energy management information will enhance Xcel Energy’s ability to manage costs by managing demand. Information about on-peak and off-peak usage with emphasis on energy cost and the reduction of emissions will encourage customers to use energy in a more price responsive, environmentally sustainable way, including the options of using distributed energy resources such as PHEVs, solar, wind turbine, vertical wind turbine, batteries, geothermal, biomass, fuel cells, micro turbine (10k RPM spinning device with harmonics) and stored energy systems. Carbon Footprint Reduction - A result of lowered residential peak demand and energy consumption, improved distribution losses and increased conservation options. . A decrease in electricity usage by 2.5 percent could cut Xcel Energy’s CO2 emissions by over one million tons annually. Capital Savings - Expected deferral of capital spend for distribution and transmission projects based on improved load estimates and reduction in peak load from enhanced demand management. Operating Savings - Potential utility cost savings from remote and automated disconnects/ reconnects, elimination of unneeded field trips and reduced customer outage and high-bill calls through home automation. Reduce Customer Minutes Out - By reducing customer minutes out through fault switching, automatic outage notifications proactive asset replacement, Xcel Energy expects to improve SAIDI by 10 percent. Transformer overloading outages were reduced by 25 percent in Boulder in 2009 due to the monitoring equipment installed as part of the project. Improved Reliability - Phase I results released in early September 2009 showed customer complaints about voltage fluctuations had dropped to ero from about 60 a couple of years earlier and there weren't any unplanned transformer failures compared with six in 2007. Customers calling to complain about power quality dropped to just over 1 percent in 2009, down from more than 8 percent of total complaint calls in 2007. Preventing customer outages is a critical factor affecting customer satisfaction. A smart grid will proactively identify devices approaching imminent failure. It will also more quickly identify current outages, nested outages, and the locations that need to be attended to most quickly to remedy those outages. The use of advanced metering applications will eliminate costly "okay on arrival" situations by being able to determine if a customer is out. Providing crews with access to this information while they are in the field will vastly improve outage restoration performance by having faster, prioritized responses. Xcel Energy’s smart grid will use the following methods to reduce customer minutes out. Customer Empowerment - Real-time pricing programs help manage demand by raising the retail price when our energy cost is high and lowering the retail price when our costs are low. However, these programs have previously been unpopular with customers because they have been complex and inconvenient. A system that automates customer energy consumption based on customer-selected preferences against both price and environmental signals would alleviate both the complexity and inconvenience. A system that enables customers to optimize energy consumption based on emissions reductions would encourage customers to leverage low emissions generation from renewable sources. Reduced costs associated with improved meter reading efficiency – representing 50% in potential operational savings over manually and interval read meters. Remote Disconnects/Reconnects – representing up to $5 to $10 million in annual savings from not sending a technician. Extending generation asset life that avoids capital investments for generation capacity requirements. Xcel didn’t file a Certificate of Public Convenience and Necessity (CPCN) before the project started in 2008 because they didn’t think they needed to for what they deemed a research project. In its pre-filed testimony, Public Service contended that SmartGridCity does not require a CPCN because it is an investment in the distribution system. Ms. Karen Hyde testified that “SmartGridCity is a distribution project and does not include any transmission or generating capacity. Under Rule 3207, construction or expansion of the distribution system is deemed to be in the ordinary course of business and does not require a CPCN.” In addition, Mr. Randy Huston testified that “to the extent the project ties to any particular portion of our system, it is distribution related…much of our SmartGridCity project consists of software, which is general plant, not generation or transmission plant. There was no process in place to address and redress all the commonplace issues that occur in such a project because the project is outside the normal regulatory process mainstream. Without a method to gracefully handle the issues, all the usual suspects (nay-sayers, utility "watchdogs," etc) have plenty to complain about. Poor Project Management - From understanding the requirements and due diligence to building an accurate business case with reliable cost/benefit analyses, the expectation setting was diametrically opposed to the actual delivery. Accurate expectation setting, quality project management and reliable cost/benefit/schedule estimations could have avoided this pain. Unclear Project Goals - The controllable loads weren't in place for it to be a test of demand response. A distribution automation test wouldn't require smart meters in 43% of homes. Was it just an automated meter exercise? Utilities have been quietly doing that for years. Were most of the cost overruns related to laying the fiber cable? Did they have ulterior motives for not using existing communication infrastructure? Was it a PR exercise? Was it an attempt to head off the political controversy that has exploded anyway over whether Boulder should renew Xcel's franchise? In addition to other possible goals it undoubtedly was a research project whose costs got out of hand. This highlights the importance of having clearly stated goals from the outset. Expensive Fiber Optics - According to Xcel, it was the cost of building the fiber optic network that serves as the backbone of SmartGridCity’s communications, a task that was given to consortium partner Current Group, that was the main culprits responsible for the ballooning cost. Not only did the utility need far more underground fiber than it originally anticipated, it also faced other unexpected costs, such as using diamond-tipped drill bits to tear through granite and bringing in cranes and dump trucks to remove boulders, the utility reported in a May 2009 document. The lesson learned is don't blast through rock to run fibre optics. Let other people do that. Use existing fibre, wireless and your own power lines (broadband over power line outside, ITU G.hn / IEEE P1901 inside) to get as many bits back and forth on the last mile as you can, wholesale. Don't reserve megabits of data connection for some vague future use, lease it off immediately for a share of the revenue from ISPs, voice and TV providers who can't penetrate the last mile without your help. Set up closets for them everywhere so the average home sees many times more data, voice and TV providers than they have ever seen before - something you get credit for. Investment Risk - One of the questions with such a large, long-term project is: where will the money come from? SmartGridCity has an at-risk funding model. Without this model, the culture of the industry is that money can’t be spent without the confidence that that money is going to produce value, and hence focus is limited to things that will work for sure. Because only exploring things that are certain to work are explored, the opportunity to give a different view of the model is bypassed. The investment did not go through the normal regulated process which allowed the study the margin to fail. Xcel has taken the risk, along with its partners, to fund Boulder in the validation of value that will come back to the customer, ultimately, in the system. Because the cost of Boulder was more than Xcel Energy was willing to put at risk, the company solicited partners for at-kind investment. The result of this is that the majority of the project is funded by Xcel Energy’s partners: Current Group, Accenture, GridPoint, Ventyx, OSIsoft and Schweitzer Engineering Laboratories. The expectation is that pieces of the program will demonstrate themselves and be eligible for that recovery. Cost Overruns - Rumor was that the initial budget for SmartGridCity was $100M but it ended up costing them $200M. According to a February 6 story in the Boulder Daily Camera newspaper, SmartGridCity has seen capital costs balloon from an initially projected $15.3 million to a new estimate of $42.1 million, and that doesn’t include operations and maintenance. "The company had to install far more underground fiber than initially projected, substantially increasing the cost ..." Xcel officials wrote in a document filed with the utilities commission last May. "We also ran into unexpected construction conditions such as having to drill through granite with diamond-tipped drill bits and remove large boulders with cranes and dump trucks ... ."
The whole affair brings into question whether smart grid services alone can justify the cost of building out a fiber optic network. While many utilities have fiber optic networks installed, they’re usually limited to major transmission lines and end at big substations, rarely venturing out into neighborhood distribution grids. Potential for Partner Conflict - With so many companies involved, there could be a possibility for conflict. However, no one company has a full solution – so the need to bring this various expertise together is key. Xcel Energy, Minneapolis, MN (NYSE: XEL) - A major U.S. electricity and natural gas company with regulated operations in eight Western and Midwestern states. Xcel Energy provides a comprehensive portfolio of energy-related products and services to 3.3 million electricity customers and 1.8 million natural gas customers through its regulated operating companies. Accenture , Much of the work will be done in Bangalore, India -(NYSE:ACN) – A global management consulting, technology services and outsourcing company; it collaborates with clients to help them become high-performance businesses. Accenture’s role with SmartGridCity is to project manage the integration and management of data flow, including automating processes, transmission and distribution of electricity. To develop the smart grid, Accenture will integrate diagnostic software, intelligent distribution assets and outage management systems into Xcel Energy’s existing IT infrastructure and will be building a lab-like environment for testing power outages, reliability and potential impacts to the smart grid. Accenture is helping define additional requirements for SmartGridCity and is specifically responsible for integrating data flows and grid system analytics that will enhance Xcel Energy’s ability to deliver electricity and serve its customers. The patent-pending Accenture Intelligent Network Data Enterprise solution set comprises a number of assets and methods, including comprehensive reference architecture, open standards-based data transport and storage architecture assets, end user transactional analytics, and a process and blueprint for smart grid development. Schweitzer Engineering Laboratories, Pullman, WA – SEL’s work in SmartGridCity will focus on the “smart substation” effort with sensing, control, communications, analytics, and automation solutions. SEL Invented the world’s first digital distance relay 25 years ago, improving how the power system provides electric power. SEL also provides solutions for Xcel Energy's Merriam Park "smart substation" project in Minneapolis, Minn. Founded in 1984, SEL introduced the world's first digital protective relay, revolutionizing the electric power industry by fault location and other features for a fraction of the cost of earlier systems. Planning and analytics for price and load forecasts and decision support for connecting customer actions to trading and investment decisions in real time. GridPoint, Arlington VA - A pioneer of an innovative smart grid platform that aligns the interests of electric utilities, consumers and the environment through an intelligent network of distributed energy resources that controls load, stores energy and produces power. GridPoint, Inc. received $15 million of VC funding in 2008 for their management of distributed storage, renewable generation, and load, bringing the firm’s total funding to over $100 million. SmartGridCity will use Gridpoint’s SmartGrid Platform™ to apply information technology to the electric grid to provide an intelligent network of distributed energy resources that controls load, stores energy and produces power. The platform enables Xcel Energy to evaluate technology and system capabilities such as advanced demand management, supply management, solar photovoltaic integration, PHEV smart charging, online energy management, instant backup power, performance monitoring and customer support. The platform applies information technology to the electric grid to enable distributed energy resources to perform the same as central-station generation. During peak periods, utilities efficiently balance supply and demand by discharging stored power from distributed generation assets or reducing customers’ non-essential loads through demand response programs. For consumers, the platform provides protection from power outages, increases energy efficiency through online energy management and integrates renewable energy, paving the way for the commercial success of solar and wind energy sources. OSI Soft, San Leandro, CA - A privately-held company founded in 1980. Their PI System software provides the infrastructure for collection and management of time series data required to monitor and implement the SmartGridCity concept. A global base of more than 14,000 installations across energy, utilities, manufacturing, life sciences, data centers and process industries relies upon the OSIsoft PI System for similar data-collection and management functions to manage assets, mitigate risks, improve processes, drive innovation, make business decisions in real time, and identify competitive business and market opportunities. Landis+Gyr - Zug, Switzerland –The largest global player in electricity metering with one of the broadest portfolios of products and services is privately held. It has a preeminent position in advanced or “smart metering systems” Over 5,000 employees, 600 full-time professionals dedicated to R&D, and operations in 30 countries across five continents. Supplied ~15,000 smart meters, which will be installed by August 2008. In June, crews will begin installing them, at approximately 2,500 meters each week. The new smart meters provide detailed usage history and automated meter reading. The meter installation will be at no charge to the customer. IBM’s Smarter Cities Challenge Boulder Report - June 2011 - "Current SGC infrastructure provides significant value to Boulder. The deployment of a high-bandwidth communication medium, thousands of sensors, smart transformers, and smarter meters has transformed Boulder’s electrical grid. SGC allows for effective 2-way communications, sensing and monitoring performance, remote control and automation and 24-hour delay reporting. To consume and utilize the exponential increase in data that SGC produces, Xcel Energy has also had to transform its grid operations, back office infrastructure and applications. These enhancements to the electrical grid infrastructure provide significant value, improving transmission and distribution reliability and stability. These advances can also reduce utility operating costs. However, the SGC project has yet to provide direct, visible customer value. When the project was initiated, SGC was advertised as providing customers with significant benefits including in-home real-time information access. This is now being piloted on a limited basis. This mismatch in expectations has been a source of friction between the utility, the City and its citizens."